I wanted a set that was bar stool height. Something that looked great & the seats have padding. PLUS ALL of the GREAT reviews!! I like the kitchen table and it was a right fit for our kitchen. The price an quality. The price and style were right for what I wanted. it says "bar stools" but does that just mean the chairs that are in the picture with the table? Yes, it’s just the chairs in the picture. Just referred to as bar stools due to the height compared to a regular height table and chairs. It’s a counter height bar stool table and chairs. Very nice for the price! They are the chairs pictured. We just bought this. So far we like it! The chairs that come with the table are the ones shown in the photo. Love how it sits high. It is very pretty and does not look cheap. It is exactly what I wanted. Not huge, but big enough. Reasonable price for a great product! Table and chairs are sturdy and look nice in our small kitchen. I bought this for my daughter for Christmas and she loves it!!! Great quality! Great color! Very comfortable! Absolutely perfect! I brought this set about a month ago and it is perfect for the small kitchen area. Looks great and just the right size. I moved to a smaller home and this fit perfect. I like the padded seats. I fell in love with the set when I first saw it when I walked in the store. This is a Beautiful Dining Set! I was shopping for a quality, casual dining set that was affordable and thank goodness it was at Ashleys! I fell in love with it back in Oct 2017 but my budget was limited. Once tax season arrived, I was ready. I had surgery so I had to purchase it online and was well pleased that it available for the price I needed it to be! Now no more dinners on the sofa, I love sitting at my gorgeous table! Perfect Fit For My Home! I purchase my Coviar Counter Height Dining Room Table about eight months ago and I has absolutely improved the functionality of my home. Also, I get compliments on the table from guest that visit my home. It's just awesome! I bought this set a couple of weeks ago and I love it! It's the perfect size for the space and the quality is great. It also looks exactly how it's pictured online. I brought this for my daughters new apartment about a month ago and she loves it! My wife and I shopped three to four different furniture stores and this by far was the best in this price range! I personally could not find anything else I liked more. Very Sturdy, nice quality, and real leather seat covering. The delivery was right on time and they were the best delivery guys we have EVER in countered! Friendly and quick! Buy this table, you will be happy! Love the table I bought it is perfect for my apartment! Love this set! It fits perfect in my room and has a very rich look to it. Delivery was on time and set it all up for me! Our Teak 8 place dining set was beautiful but just too large for the 2 of us anymore. The Coviar 4 place set is beautiful and the perfect replacement. It's solid and comfortable and fits our evolving lifestyle. Could not have done better. Great Table for a Great Price! I bought this last month and I couldn't be happier with my purchase! I was looking for a table that wasn't too large for an apartment, but was still a solid wood table and this was perfect! Both the table and chairs are extremely sturdy. I bought this for my small kitchen area and it's perfect. The color is my favorite part. Looks great and fits great. Awesome table! Looks amazing! Very sturdy and beautiful color! I love it! 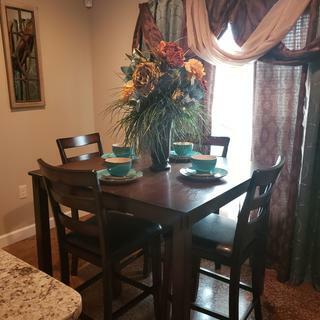 Purchased this dining set for my kitchen and it is perfect! Well made, sturdy, comfortable. Love the counter height chairs! Looks great! I am very happy with my purchase! This table is like a 4 seater high top table you'd sit at in a bar - except with comfier chairs. It fits in my breakfast nook perfectly. The Dark wood finish is awesome. I would recommend this for a small family, to put in a small apartment - or to add more space in your basement bar! looks beautiful in the breakfast room! wonderful addition to the house! The order, delivery and set up process went smoothly and on time. No problems/imperfections with the product when I received it. It's a good height to keep my large dog at bay when he comes begging for scraps. It's simple and elegant and is well made. The chairs are not overly plush but are comfortable and it fits nicely in our apartment. Ordered this table for my kitchen and I love it. I gave it 4 stars only because the screw you have to use to assemble every leg gets annoying. Once put together the table is beautiful. The table is fantastic. We love it. The problem is one of the chairs came with a loose foot rod at the bottom of the chair and the repair company never came to fix it. Nicely sized, sturdy table. The table top is VERY prone to scratches, and was scratched within the first few hours that we received it. Use a tablecloth or placemats as soon as you get this product. Other than that, the chairs are sturdy and the cushions are comfortable but firm. I bought this table about a month ago and my wife and I are still loving it! Not a chance that I will disable Adblocker, no idea why this would be a prerequisite to rating. The table is nice other than when they installed the legs at our home, delivery gentleman over drove the screws and cracked the table. We didnt see it until a week later. The chairs have really big issues, all four have leg issues causing the chairs to rock. I guess for the price I should have expected quality issues but the chairs are ridiculous. ...fell in love with this set the moment I saw it online and was pleasantly surprised that it was even nicer on the showroom floor. While it's comfortable and sturdy it does seem to be cheaply made. The finish comes off way too easy. As a single person with no children, I take care of my things. Chairs have small holes/scratches, which is not finished well. They should have applied dye properly. Apart from that no complains. check it out before the driver leaves. one chair wobbles so bad i can't believe they shipped it. an inconvenience to get it resolved. With a truly unique construction, the flawless rugs found within the Village collection by Surya will radiate a sense of natural charm from room to room within any home décor. Hand woven in 100% Sea grass with a cool cotton border, each perfect piece effortlessly expels a sense of cool comfort that will surely update your space while maintaining a sense of subtle elegance. Gain three times the contemporary sophistication with the Claudine bowl set. Hammered metal finish over black and goldtone is so in vogue. With an organic edge around the top, these bowls make a stylish statement. Contour pendant light is sure to delight those looking for a chic, contemporary look with a shapely twist. Note how the finely etched design gives this pendant light’s transparent glass added dimension. Anglophile style. Framed vintage map of London brings a subtle, sophisticated touch to a home office or living room. Clever hints of distressing make it appear this work of art has traveled a long road.